It’s not the same, Honey, since you’re not around. 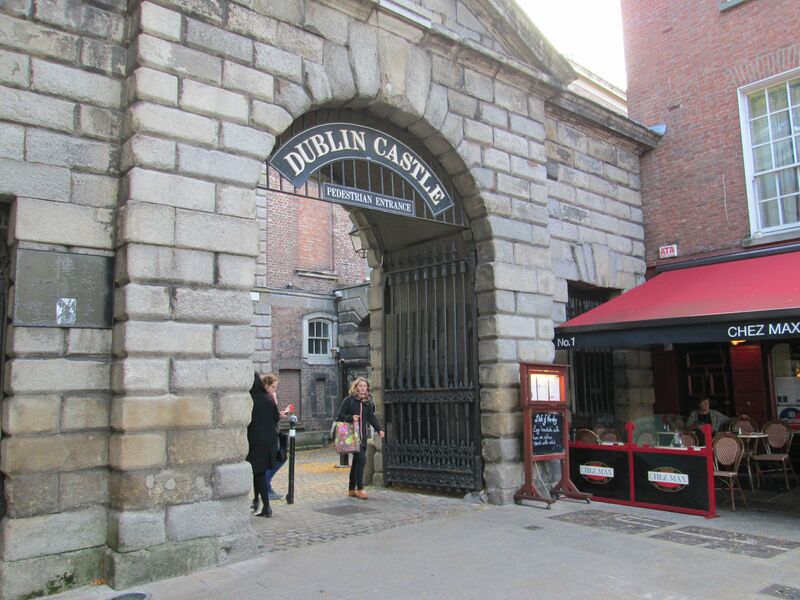 Dublin’s Old Town was delineated by its walls. Mostly vanished now, some fragments remain, and vestiges of the ancient street plan allow us to follow an imaginary walk around the ancient city. The Dane’s settled here in the ninth century, dropping anchor at a tidal pool just off the Liffey, fed by the River Poddle. Their settlement was known by its Gaelic designation, Dubh Linn, meaning Dark Pool. The Poddle, now just a stream, flows underground, while the footprint of the pool remains as an ornamental garden, along the southern walls of Dublin Castle. At the Lower Castle Yard, you can see that the ground is low enough to accommodate a natural moat. To head downstream towards the Liffey, leave the Yard and cross Dame Street. A narrow covered laneway passes to the side of Brogan’s Bar, leading into Crampton Court, to the rear of the Olympia Theatre. Dilapidated now, and a bit dodgy, this was a bustling centre of commerce in Early Modern days. Dublin’s first coffee houses sprang up here, popular meeting houses for traders and merchants before the building of the Royal Exchange. Leaving the Court, a narrow covered alley leads out to Essex Street, by the Dublin Theatre Festival Office. The old Custom House once stood opposite, before Gandon’s Georgian masterpiece was built further east around 1800. The site is now occupied by U2’s Clarence Hotel. After the eerie silence of Crampton Court, it’s into the rattle and hum of Temple Bar. Close by to the right, the Project Arts Centre was an early manifestation of arts and entertainment a decade before the Temple Bar scene bloomed. Here in the Seventies, prog rock and punk jostled for attention with art and drama. Jim Sheridan cut his teeth here with the likes of the prescient Inner City Outer Space. Heading west, Parliament Street marks the extremity of Temple Bar. Standing here one night recently, waiting for a friend, I experienced the tangible beat surging through the district. Back to the river, I took in that iconic Dublin view of the City Hall, even more dramatic when illuminated at night. One of the finest Georgian buildings in the city, it was originally the Royal Exchange. We had a drink and Fish n Chips in the Porterhouse. This was the first branch of the pub chain beyond its Bray home, now Porterhouses can be found in London and New York. Some things change, while others remain the same. Read’s Cutlers is Dubli’s oldest shop, dating back three hundred years. The Turks Head Chop House across the street harks back to ancient times, the Czech Inn, more recent. That night, we headed towards Vicar Street for the Waterboys gig. Retracing old and ancient footsteps. This was often our route home after a gig at the Project or Zeros. Those days it was deserted around here, now nightlife and daylife are colonising the area too. We pass Cow Lane with it’s restaurants rising in terraces up towards Lord Edward Street. We join Fishamble Street as it curves uphill. This was Dublin’s original fish market, as the name suggests. This was also where Handel’s Messiah first rang out. At the Great Music Hall in 1743, seven hundred people enjoyed the first performance. Anticipating the large crowd, men were requested not to wear swords, women to refrain from wearing hoops. Christchurch Cathedral occupies the highest ground of the Old Town. Just below the cathedral, which dates back to the 12th century, are the Civic Offices. Sam Stephenson’s ‘bunkers‘ at Wood Quay, site of the original Viking town, excited great opposition. Twenty thousand marched through Dublin in 1978, but ultimately the campaign failed to halt them. Screened by more postmodern structures now, the four brutalist towers are less ominous than they originally appeared. Winetavern Street appears to pass through the heart of Christchurch. 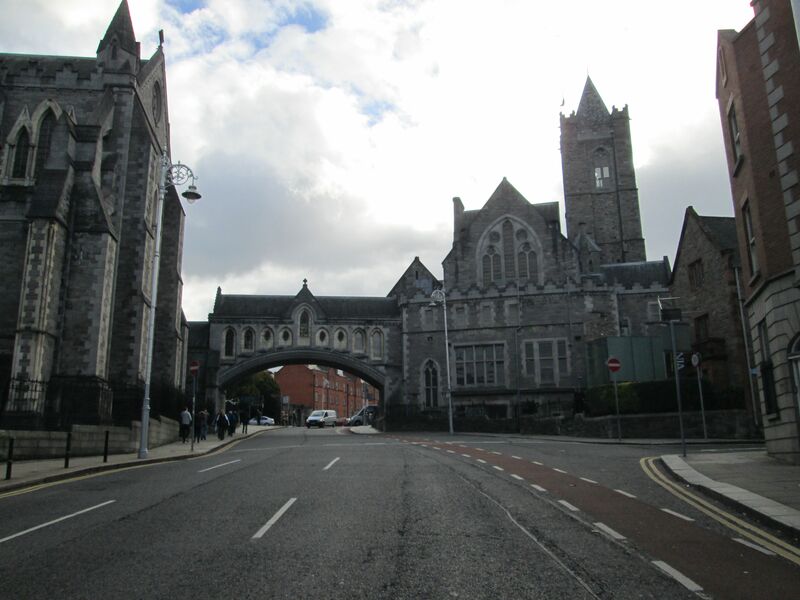 An elegant Neo-Gothic bridge spans the road to join the cathedral with the former Synod Hall which now houses Dublinia, an extensive exhibition of Viking and Medieval Dublin. St Audeon’s Gate on Cook St.
Further west, along Cook Street, is the only good segment of wall remaining. Well restored, it gives some idea of what it would be like approaching Dublin in medieval times. The segment incorporates Saint Audeon’s gate, the only remaining city gate. St. Audeon’s Church is just above the gate, a modest structure established in early Norman times, it has witnessed great urban expansion over the centuries. Bridge Street descends to the Liffey, for a long time this spot was Dublin’s main fording point. In the twelfth century, a tavern was established here and the Brazen Head lays claim to being Ireland’s oldest public house. Dean Swift is said to have lowered a few here, probably en route to or from Celbridge and his trysts with Vanessa. Across the road, O’Shea’s is one of Dublin’s most renowned trad and ballad boozers. Back to the top of the ridge, there are actually two St Audeon’s churches. The Catholic church is housed in a more imposing neo-classical structure. It is the designated church for Dublin’s Polish community. Passing outside both is Cornmarket, though there is nothing bucolic about it these days. 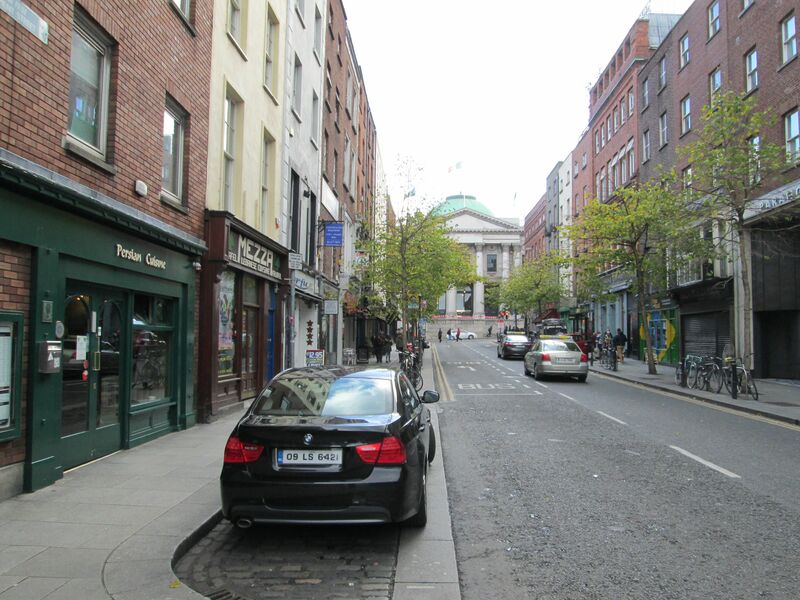 The over-widened thoroughfare sends a constant stream of traffic west towards Thomas Street. Crossing the street, shades of Eddie Murphy in Bowfinger, Lamb Alley has a small fragment of wall. We are near the westernmost point of the walled town. From here, the walls sloped downward and eastward, cutting across Patrick Street where the Iveagh Trust Buildings now stand. Iveagh Buildings on Patrick St. These were built in 1904, a housing development for the poor of the Liberties. The surrounding area had become a slum by the nineteenth century. The first Lord Iveagh, Edward Guinness, great grandson of Arthur, had established the Trust to provide housing in Dublin and London. The massive five storey blocks stretch all down Patrick’s Street to Saint Patrick’s Cathedral. 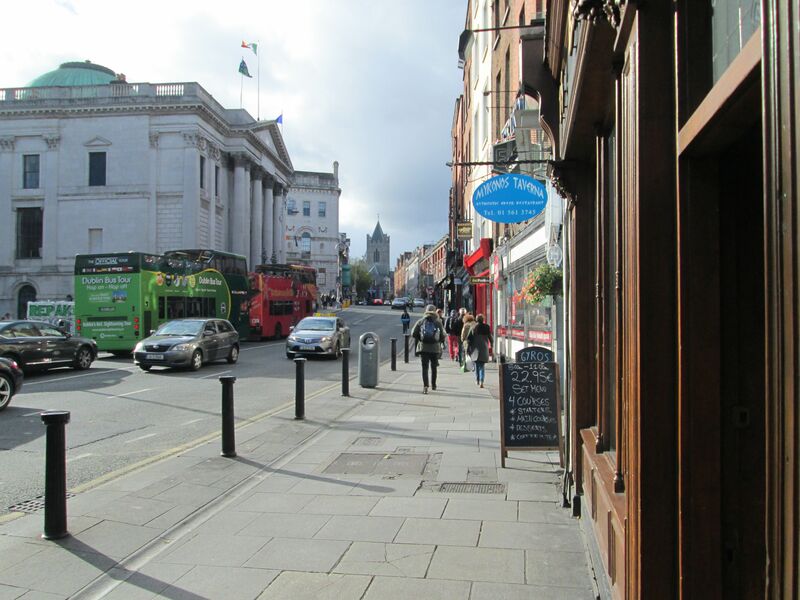 In red brick with mansard roofs and gabled fronts, they are a distinctive and unified feature of Dublin’s streetscape. The complex also included public baths and a men’s hostel. On Bull Alley Street a ‘People’s Palace’ was built in a more ornate, grander style. This provided recreational and canteen facilities for the young of the area. It came to be known as The Bayno, an essential part of growing up in the Liberties. Closed in the 70s, it is now the Liberties College. Iveagh also developed the park opposite, it offers a great view of the St. Patrick’s Cathedral, the largest church in Ireland. Swift, Dean of the cathedral in the eighteenth century, was himself a passionate advocate for the poor of Dublin. Drapier’s Letters, A Modest Proposal and, arguably, Gulliver’s Travels, cocked a snook at English colonial misrule. At Werburgh Street we are nearing the precincts of the Castle again. St Werburgh’s Church once had a soaring spire, but unfortunately it overlooked the Castle yard and was soon demolished. Nearby is Leo Burdock’s fish and chipper, Dublin’s most famous. Local resident Leo established it in 1913. Derby Square was also nearby. This obscure enclave features in Phil Lynott’s evocative ballad ‘Dublin’. Ship Street seems far inland for such a name. But it leads down to the location of the original Dark Pool. This is now an ornamental garden along the south wall of the Castle. The Chester Beatty Library was moved here at the Millenium. The American mining magnate had established an unrivalled collection of oriental arts and crafts. There is a good cafe in the entrance atrium. Gaze up at the Castle from the grassy surface of the old pool. It has taken a thousand years to get here, the walk itself took just over half an hour. You’re not around this Old Town.